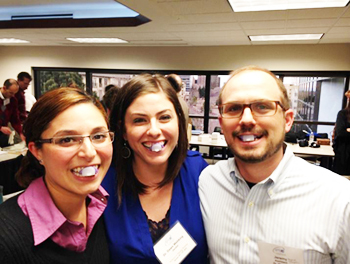 Chastity, Jeremy, and I had a great weekend at the International Partnership for the Study of Occlusion (IPSO) course in Denver. As many of you know, my husband, Jeremy, is a Physical Therapist. Working together over the last few years, we’ve come to find that some spine issues originate from the TMJ, and vise versa. It was really fun to share the IPSO philosophy with Jeremy so that he could better understand the dental side of the story. He didn’t even fall asleep once! In a few months, I’ll be joining Jeremy at a physical therapy course. 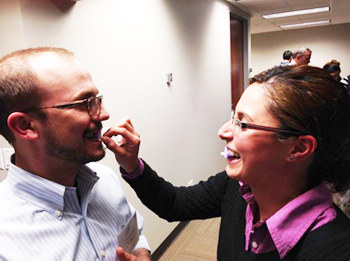 I’ve been teaching Chastity about occlusion and TMJ over the last year. She had some hands-on experience this weekend and now feels like she’s got a better understanding of how occlusion (the way your teeth fit together) affect the muscles and joint. We are so thankful to have had this weekend to sharpen our skills so that we can be more effective at caring for our patients with facial pain, headaches, cracked teeth, TMJ pain, and even sometimes tinnitus (ringing in the ears). Here we are making a quick version of an anterior deprogrammer– an appliance that we typically use as a diagnostic aid to rule in or out occlusal problems.